Once upon a time, not too long ago, not only did I not have a sweet tooth, but I could care less if I had chocolate or not. Teena would buy chocolate and put it in the freezer knowing it was all hers, to have a piece of here and there, whenever she felt like it. After I had my operation, that all changed. Suddenly I had a sweet tooth. Suddenly I loved chocolate. Suddenly her chocolate was no longer safe in the freezer. Soon I found myself with a bit of an addiction to chocolate-covered M&Ms. Small bags no longer lasted and finally we went a bought a big one. I would fill a shot glass with them to munch on one at a time. I was on a high dose of Prednisone, a medication I was on until this week. One side effect it has is that it causes food cravings and hunger. As I was weaned off the medication, my cravings lessened. Now a small portion of M&Ms remains in the bag and sits mostly untouched in the freezer. They don't call to me anymore the way they once did. But I haven't stopped eating chocolate everyday and I do it for healthy reasons. The chocolate used in chocolate bars, M&Ms,etc. is made with milk chocolate and added sugar. In fact,there is almost 9 grams of sugar, over 2 teaspoons, in 20 M&Ms. Dark chocolate is different and I eat it for a reason. My blood tests show that I am low on iron and magnesium, two things a body requires. As well as taking supplements, I researched foods high in both. I found dark chocolate (not milk chocolate) to be high on the list. 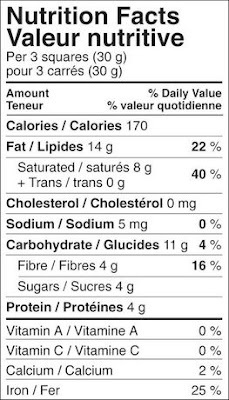 On the right is the nutritional information for Lindt dark chocolate. The top one is for dark chocolate, with 85% cacao and the bottom is for the 70%. I have 3 squares of the 85% each day. The 85% contains 25% of a person's recommended daily allowance of iron. What is not shown is that it also contains 25% of your magnesium requirement. This drops to 10% of the RDA for iron and 15% for magnesium in the 70% bar. 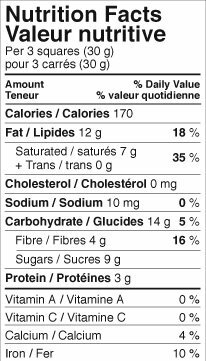 Also, there is much more sugar, 9 grams, in the 70% compared to 4 grams in the 85%. Keep in mind that 4 grams equals 1 teaspoon. I have always enjoyed foods and drinks that have a bit of bitterness to them. The 85% has that slight enjoyable bitter bite but one that is not overpowering like bakers chocolate. 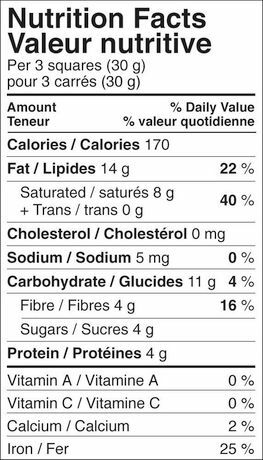 The 4 grams of fibre is good news, plus there is no trans fat. 170 calories can put some people off but there is so much junk out there that has more calories and little benefit. So after every meal, instead of dumping down a bunch of M&Ms, I have a square of chocolate. Tasty and better for me. Now, to get myself off of the nighttime munching. Hey! One issue at a time!